Trusting your self-trust is the best thing you can do for you. The path to possibility is paved with small steps (E’s walking debut). I have always wanted to be great. To be great sets you a part. To be able to be great will make you a success. Have a goal, focus on the goal, achieve the goal, achieve success. It’s not a radical formula, but it had worked. Outwit, outsmart, outplay. Be 3 steps ahead and you have an advantage that when combined with dedication and a little bit of luck sets you up for success. I have always known that success required support, teaching, learning but help had typically been offered as people saw my potential. I worked hard, and then I would be encouraged. A formula that had worked for years in my career…and for a long time, being successful in my career meant I was successful in my life. Then, I had children. My children. Circumstances where goals, dedication and luck would only carry you so far, before medical diagnosis and reality took over as the long term treasure map of what lie ahead. This caused chaos in my optimistic, resilient, Type A brain. How was it possible that, with enough focus, attention, savvy, and positivity that something might not be achievable. Why wouldn’t I be able to be the voice and catalyst to find a cure for Angelman Syndrome? 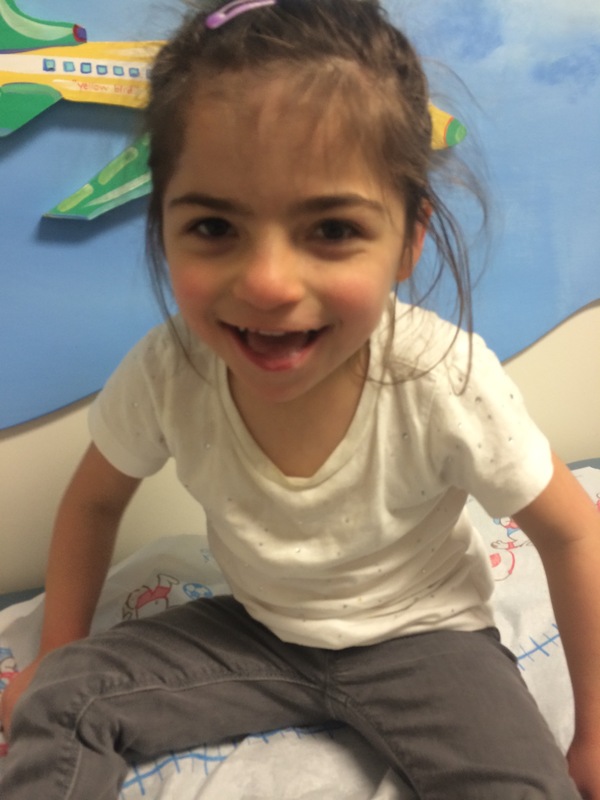 With enough therapy and hard work, Emma would be like all the other typical children. In first grade Quinn flourished. His 40 year old soul wrapped in a 6 year old body with a sweet voice and curious but wise disposition, Quinn had a higher consciousness. I knew it, teachers knew it, parents knew it, and everyone with a developed prefrontal lobe could tell Quinn has special. In October of that year, Quinn came home one day and asked me when Emma was coming to Kenter? I explained that we weren’t sure that it was a good idea and that Emma might struggle there. Quinn looked at me quizzically and a bit dumbfounded as the tried to connect the dots of how she could possibly struggle if he was there, and all his friends, all who would take care of Emma. In his eyes, I saw the reflection of my own childhood. I was projecting, but I am a Gen X parent, isn’t that what I am supposed to do so that I don’t repeat perceived mistakes? But this wasn’t a mistake I had seen before. I remembered the cruelty of children when I was young, to kids who were different or special. Emma’s inability to speak a language that most people can understand overwhelmed me with fear, and the memories of taunting and mimicking that now make my heart break in two. With the look in Quinn’s eyes cemented in my mind, I gathered strength, met with district and informed them we were ready to mainstream Emma into school. With a heavy heart, tears and trembling we brought Emma to school the first day after the holiday break. An aide met us, and I walked with Emma to her classroom and in slow motion let go of her as she started her new adventure. I was terrified. 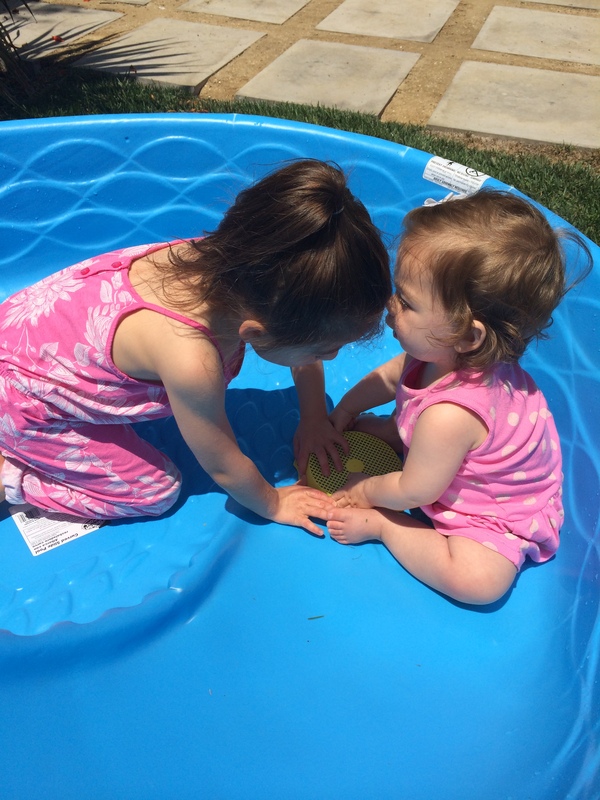 Each day, Quinn would come home and tell me all about Emma’s day. How he had been asked to go in her class and read, how he had gone to see her at lunch, and how he had seen her on the playground with some of the other girls in her class bouncing to the music. I trusted him to be my eyes and ears on the ground as I lived in fear each day releasing her into my version of the wild. In her second week of school, Quinn came home and said he wanted to do another version of his lemon-aide stand to raise money for to find a cure for Emma and Angelmans. I could see my kaleidoscope of tears reflected in his glasses and he waited for me to say yes. How was it possible, this 6 year old child belonged to me, to our family and to this world? I hugged him, said yes, and with a suggestion of our family babysitter, Hot Cocoa became the Quinn’s catalyst for a cure. To warm hearts and hands one $4 cup of real or virtual hot cocoa at a time. Then he looked at me as if waiting…ok, so now what. I had never been great at asking for help. My version of success was to figure things out on my own and this was only amplified when it came to helping to fundraise for Emma. For Emma, my baby, my angel, I had always felt like I should do something. But it had to be big. A movement. I was a marketing executive, wasn’t this my whole job? I had held a brainstorm early in Emma’s diagnosis trusting a germ of an idea would come, and I would action it. Friends came together eager to help, but what I know is that I didn’t trust myself. I wanted an ice bucket challenge moment to raise the $30mm dollars in one foul swoop. I had clients that spent $4 million dollars to buy a Super Bowl spot, so that was just the equivalent of 8(ish) Super Bowl spots, surely I should be able to figure that out and make it happen. The pressure I felt was immense, but the guilt I felt for not acting on it was suffocating. So at 6 years old, with just a simple request, Quinn didn’t push, but rather pulled me from my narrow world of helping Emma into the world of possibility, but we would need help, something for which I was not entirely good at asking for. I had one problem in my fear of Emma’s day to day, I felt isolated. That we were different than everyone and why would anyone want to help us with something that was really for our family. But I had no choice, Quinn was counting on me. So I crafted an email to my mom friends, family and some moms in Quinn’s class that I knew, but not well. I explained what we wanted to do, that, as they knew, Emma had recently started at the school, and that Quinn wanted to do a Hot Cocoa stand to help find a cure for her and Angelman Syndrome. I sat in front of the screen, staring, tearing and fearful to hit send. At the time, I probably could not have articulated my fear, but now I realize it wasn’t fear that people would say no, or wouldn’t want to help, but rather fear that I had somehow failed my daughter, fear that people would know I didn’t have it all together, fear that people would think I wasn’t great at being a mother, let alone a mother to Emma. Fear that I would have to show that I needed help and I couldn’t do it on my own. I can hear the click. my finger tapped the key, and off it went. Within minutes, I had responses. How we can help? What can we do? My now dear friend Erin, mocked up a poster and upon my approval had banners made. Another mom called the principal and ask for his support to start including the specifics in newsletters and school communications. Within hours, people have volunteered to help set up, to bake, to spread the word and to have their children help work the stand. I couldn’t believe it was all happening so fast. And no-one seemed to know that I had failed my daughter. As the event ramped up, I decided that we could take the message wider, more broad and give Quinn some more support for his kindness. I asked Quinn if it was ok if I sent a message to all of mommy’s friend and work colleagues past and present? He said yes, so in another act of what I will call courage, I wrote another email that explained the story of Quinn and Emma being born 3 months early, the journey of being diagnosed with Angelman Syndrome, and the life that has given us so much perspective and a way to understand the importance of kindness and hope in a different way. I paused, took a breath, thought of Quinn’s trust in me and hit send. Within minutes, donations for virtual cups of cocoa with messages of support came flooding in. My boss and former bosses showed up with large donations to support Quinn in his mission…I was overwhelmed with the kindness myself. I didn’t stop crying for days and with each act, my guilt subsided, and my clarity and trust grew. That year Quinn raised $40,000 with the kindness of people near and far. He had a successful real and virtual cocoa stand and all the people in our school came to know Quinn and Emma. Kenter Canyon Elementary rallied and the principal Dr. Terry Moran gave Quinn every platform to share his story promoting inclusivity of Emma and education for the students and parents in the community. The subtext, we are a family and we support our students. Last year Quinn’s Cocoa for the Cure raised an additional $80,000. The story is remarkable, and one day, I will sit and write it all as even last year, with 2 real life cocoa stands, a virtual cocoa stand and one Lemon-aide stand Quinn felt the swell of true kindness, and me, his mommy came to see what it truly means to be great and to trust in those around you. Great is not an achievement. Great is not a goal. Great is a moment you start something with a purity of heart and intention. A moment of kindness is great. A choice to be kind is great. An opportunity to share a message of kindness is great.The opportunity to feel what it’s like to trust in those around you is great. But you have to start. Quinn is great. Quinn started. 6 year old, blonde haired, blue eyed, glasses wearing, 40 year old soul Quinn started his quest for kindness by donating $80 from 3 lemon-aide stands outside our house to find a cure for his sister. He just felt it, and asked for help, and did it. It is a simple formula that takes great courage for many of us who have years behind us giving us experience that shapes our perceptions and perspectives. But to strip it all away, can change your entire state of being. Quinn helped me understand that I had not failed, but rather was doing the best I can. He helped me realize to be vulnerable is wonderful and freeing because humans are kind and they want to help. He showed me that when your heart is pure and you trust in them, people will lift you to great heights as they are inspired by your mission to make the world a better place. I am grateful everyday for Quinn’s Cocoa for the Cure. For Quinn’s kindness to the world, and most importantly to Emma. His genuine spirit gives me hope, shows me patience and illuminates what’s truly possible if we stop trying to be great and we just start. I hope you start something today that makes today ‘yournewfavoriteday. Who would have thought that 9 years ago tonight, at 11:30 pm as I lay in the hospital bed watching SNL and listening to KSP’s increasingly heavy breathing as he drifted softly to sleep that I would go into labor. That just 8 hours later, I would have 2 tiny, frail babies who would suddenly transform my role and purpose in life and on this planet. We have grown together as we find our footing in the journey that has been set for us, but the paths we choose and take end and begin in nooks and crannies where we find great moments of joy, surprise corners that tug at the seams of fear and sometimes the very dark places that we are afraid to go so we try to keep the door closed for a little longer until it’s time to throw it open and shine the light and figure it out. While I could have never imagined this would be my journey of motherhood, I can never imagine a world where it isn’t, and yes it does define me. It does complete me. It makes me whole. E, through her innocence and purity, keeps me grounded in what’s important. What’s real. What life really means. To show up and be there even when you don’t know what it all means or where it’s all headed. To create the space for kindness and patience and learning and grace for myself as a mother for all of us as humans just doing the best we can. And so today I saw them, I looked at them, I felt them turning 9 in just a handful of hours. I saw them growing, and felt the familiar creep of the reminder that, while E will always be our baby, Q is starting to look for himself and see himself as part of this larger community and life and for me. It’s the same feeling as that night in the hospital. The feeling of unknown, of pause, of slight fear, of excitement, of joy, of selflessness and love that this is a new chapter. But as a lover of books and writing, I am not afraid in the same way. I know that only in chapters do we have the chance to try, learn, reflect and build upon on our past choices and moments. 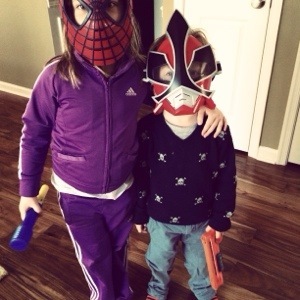 And there, in the moments, so many moments, he is still my little boy and E is my little girl. My baby 2 lb boy and girl who fit down my shirt for hours as I would rock and sing to them and tell them stories about what the future would be outside of those white walls. My 8 year old boy and girl who now in the quiet moments are soothed as I sing them to sleep or rub their back. And for tomorrow, I will make you feel my love, which isn’t just our song, it’s our hymn sheet. You will feel and know you both make each day ‘mynewfavoriteday’ in some moment, in some way. Today, for you all, if you have minis, cuddle them just a bit more, if you have people you love you haven’t talked to in a while, reach out, because our minis won’t be mini forever and life can change in an instant, and so there are never enough moments to love a little more and show how much we love all of our loves forever and always. Happy Birthday my loves. Mommy loves you. I am sitting outside on our back steps. They are hard, but warm from the afternoon sun. It’s not comfortable, but it’s not uncomfortable enough to send me inside away from the overcast skies with a hint of sundown pink and the light breeze that ruffles my hair and dress. The hummingbirds are here, they came to comfort me. To remind me. A few minutes ago, E and I sat out here…I miss here. It was a fleeting moment. She was pulling her hair out of her head to mouth it, a new and disturbing compulsive behavior, so I pulled her out of her beloved trampoline and held her. We looked at one another, her clear greenish hazel eyes watching me to understand what was happening, and my blue gray teary eyes looking at her in bewilderment, love and overwhelming loss. Loss of control, loss of my trip to Italy (“Welcome to Holland” by Emily Pearl Kingsley) and loss of my own ability to remain full of optimism and “we can do this,” in essence, the loss of my powers. I miss this place, my safe place. I am not sure why I stopped writing, this was my therapy. Perhaps too many other things happening in life that were not to write about, but to process like all other Los Angelenos and urban dwellers in the safety of the therapist’s office. Life, it’s not perfect. But then I ask, what is perfect? What does it actually mean? Who is the judge? Isn’t this a journey, meaning it does not have a destination? There isn’t closure but rather just the continuing growth as a person in my life, in my relationships, in myself. Today, I had to come back. The past several weeks have brought me here. E went to second grade, Q and E will be 8 in just a month. 8 years old. Q started second grade, such a big boy. M started her second year of preschool as a penguin. 4 going on 14. And E, angel E, she started, stopped and started second grade. Caught in between growing and changing. As a mom, I can never tell if I am winning or losing, ahead or behind. With Q and M, they can tell me or indicate when I am up or down, but with E, I have to guess. I have to be always on to know, to assume, to try, to grab at straws, to hope that what I am doing or not will be the right thing. I have to believe without knowing that I have the tools or that I can learn them. I have to push people that don’t want to be pushed, to change people’s minds, to persuade, cajole and pressure. I try so hard to remind and remain grounded in my gratitude; but, some days it’s so hard. Anyone who has ever gone through anything knows this feeling, and yet each day there is something. I kissed Quinn goodbye quickly as he ran inside the gate, relieved to have made it before the whistle and no residual dew of the walk we had just had from our house. E, M and I continued up the sidewalk and approached our group of friends from school, one of the very kind dads offered to help and I politely declined. It was obvious to everyone I was struggling and it wasn’t bound to get a whole lot better in the next 200 yards. We kept going. E continued her protest, and I continued my pursuit of this as an opportunity to learn and teach ‘not like.’ as part of the communication system. Neither was working very well. M joined in the fun as she decided she also no longer wanted to walk, started crying and suggesting she needed to be carried. I am pretty sure we were approaching the moment when I too would need to be carried, but just as E went to sit again on the ground, 2 of my friends walked toward me and offered to take M. My instincts were to say no, but recognizing my challenges, I encouraged M to go with them. Sometimes even your baby can tell when you need help and M looked into my eyes and allowed herself to be swooped up into the arms of my friend. E and I pressed on…we finally made it. In the office, I kissed her goodbye and fearfully sent her on her way for day 3. As I left the office my eyes filled with tears. I was tired, scared, embarrassed and grateful for the help. When I came back to the group to pick up M, she was delighted to see me and I could see the compassion in everyone’s eyes as my own were still wet with tears. You may have sensed I am back for a reason. Back to my safe place, the place I think about when I get overwhelmed, to take refuge in my words, as little by little the hard casing that keeps me mostly put together each day starts to chip away and suddenly I feel each and every one of the hundred reasons to cry as if they are the each and only one fighting for my attention. I can feel it as it happens. Events, things beyond my control creep in, stripping me of safety I can usually find in optimism, a smile, a laugh and my ability to compartmentalize through work and day- to – day life. But eventually, no matter how well I think I have done, or how well I am “dealing with things,” it comes back around as an uneasy feeling in my stomach that creeps up through my chest, constricts my breathing and hurts my heart as I blink back tears…it is fear. Over the past few months several moments, actions and events have come together to begin the drum beat of anxiety and sadness. I am not depressed, I am scared. Under normal circumstances these things happen in isolation and it’s easy (or easier) for me to see past them as to what’s next. What’s the plan I need to implement to get past it, but then 4 weeks ago something happened to my precious E and I have not been able to shake the fear for it is grounded in the deepest love. We have become accustomed to everything changing in an instant, so that morning when I caught E jerk out of the corner of my eye as she sat in her chair at breakfast, I knew something was wrong. She had not been herself that morning and I could tell she wasn’t feeling well, but she wasn’t warm so I thought there was no real risk of a seizure, and I was wrong. As I unbuckled her and swept her up in my arms, I could feel my heart racing and my stomach dropping. I never knew what these moments would bring, how long they would last, what would happen next. As I pinned E to her side on the couch and suctioned mouth so she wouldn’t choke, I felt the peace of the past 5 years wash over me. This was somehow its own weird form of normal for me. I hated that moment. Even now as I sit here, I don’t understand the reason. I know I was chosen for E and she for me. But as each passing day seems to throw another challenge for what lies ahead, my chest gets the too familiar tightening feeling. The lump in my throat swells as I blink back tears and worry, shame and fear. Worry for her future. Shame for my feelings of frustration and questions and fear that I am not doing everything possible but mostly fear of what’s left of the unknown. When E was tiny, it still felt like we had so much time to figure it out, but with her 5th birthday just days away and the new threats to her daily life and my sanity, that seem to present themselves without warning or care, I feel the clock ticking. Like a big giant 30 second-hand echoing in my head. Seizure medications, trusts, estate planning, school preparations, therapy accommodations, it’s like wave after wave or inexperience and unknown crashing down, threatening to grab me, sucking the oxygen from my lungs in an icy swirl of flailing arms and legs trying to find which way is up. Choosing who gets what, planning for all of E’s arrangements. Who will care for her if something happens to us, and what is something happens to them. How do we prevent her from getting turned over to the state? How do we afford it all? How do we make sure Q and M know they are loved and no matter what happens we had to plan for E because we can’t put it on them to take on such a massive responsibility? And then, I stop. I breathe. I cry. I come back here. I put it all out into the world and hope that is comes back to me in some organized fashion in my head. I take myself outside of me and look around at all the other people that find such joy to have E in their lives and by virtue of her, we get to receive them into our lives and find our own comfort and joy. I think about the families I have spoken with and how what we have learned has been passed onto them so they can try to find their own sense of peace in this world of unknown. I think about my mom and dad and KPS’s mom who can be with E and really see her just as they do and not with the veil of protection and sometimes anger I find with the outside world for how they look or interact with her once they know something is different. I think about how everyone roots for her and gives us such overwhelming support and love that I marvel at how lucky we are nearly everyday. I think about Q and M who are thrilled with her progress and allow for her unknown grievances against them. I think about how our eyes are opened to a world of compassion and empathy beyond us to other families who have it far worse than we do. 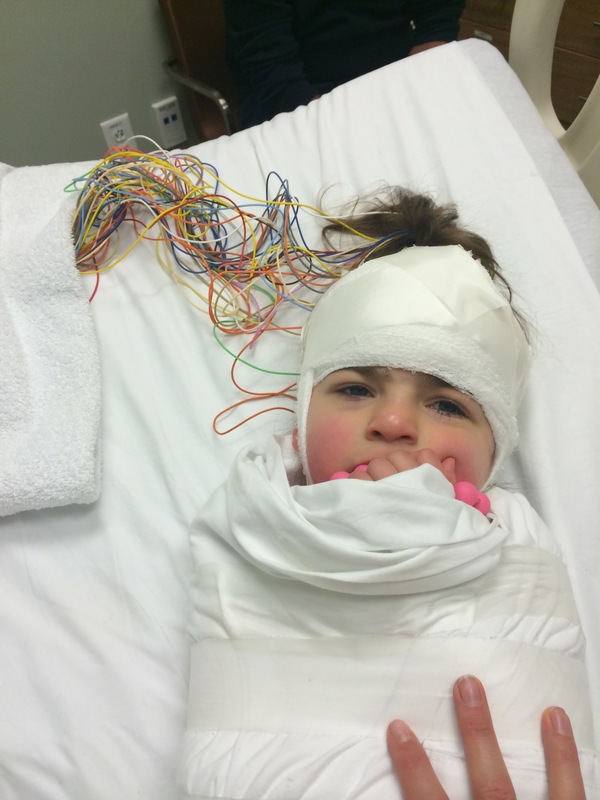 E getting her EEG on her brain waves to track seizure activity last Friday. Even in her misery of being wrapped up like a burrito she showed she could find a reason to smile. Change is afoot. Life is throwing reasons to cry. As of last Friday, E will now go on seizure medication. Since her last bout of seizures, she has started having more frequent mild everyday seizures and while I had desperately hoped to avoid this medication, it seems it is another milestone in this crazy journey. I see her growing and changing and time feels like it’s slipping away to give her everything she needs and deserves. The tears are always near. And now, I stop and remember E. I feel her in my soul reminding me there are so very many reasons to smile. She and her brother and sister are here. She is happy. She is joyful. She knows she must work hard and she doesn’t know anything else. She knows her giggle is infectious and her smile even more. She knows to trust us. She knows her accomplishments come in baby steps not huge leaps and she knows that we must take one step at a time. No matter how unstable it may feel and sometimes we may fall down, we can’t sit and cry, we must get up and move on to get better. To find stability. To create confidence. She shows life everyday 1,000 reasons to smile, and in this moment, I know my sweet 4 year old E, who does not talk, yet tells me a million things, is exactly right, through her smile. If you have ever met one of these people, you know it instantly. They shine brighter than us all. They infect us with optimism and the thoughts of possibility. We subscribe to their joy and lust for life, and when they leave us, we feel the void so deeply we struggle to find the words to capture it properly. We must lean on one another and layer on to one-another’s stories, and memories, and smiles as we remember “that time” we as individuals, will never forget. When KSP called me on July 7 as I touched down in Detroit, he led with, “I have some weird news.” Unsure what “that” meant and how to react, I paused and uttered “ok.” His words that followed landed like a bomb on my heart. “I think Will is dead.” I sat in shock as I felt the beautiful supernova of Will’s soul scream past me and evaporate leaving me only in deep sorrow. My inability to rationalize what KSP was telling me came from the larger than life footprint Will created with everyone he met. It came from knowing his incredible wife, our friend K, whose own vibrancy and grace was what balanced Will and tethered him to this planet so that we could all dip in and out to benefit from his gifts. It came from knowing his children who still model everything I hope Q, E & M will grow up to be one day; kind, thoughtful, polite, passionate and smart. It came from the notion that those of us that were lucky enough to know him beyond in passing, feel as if we wallow in that cavernous area left behind, at least so I thought until we went to his service. As I looked down at his program, nearly 2 months after he passed away in a tragic accident while on holiday at a wedding in Zimbabwe, it hit me that Will’s birthday is today, October 5. I knew Will’s birthday was in October. I had always thought it was the 13th due to the times we had celebrated in the past, the most significant of which was October 15th, 2009, the night I stayed out late, 28 weeks pregnant paying tribute to Will at a club in Hollywood. After a fun filled evening of having random club goers come up to touch my burgeoning belly, and Q and E bouncing around with the thumping of the music as I sat under Will’s careful eye to make sure I was feeling ok and had enough water to drink, KSP and I came home and 3 hours later my water broke and our lives would never be the same. If you have spent any time here then you know I believe everything, every moment, every person comes into our lives for a reason. Whether you know why immediately, or the big reveal is reserved for a series of chills that takes over your body as the realization of the impact of a chance meeting in a pool in Mexico would change your life forever as you sit at a service to say goodbye, you almost always come to connect the dots eventually. Will’s gravity pulled us in as we enjoyed a vacation in Cabo. Between a water spout and hurricane like conditions, we bonded with the Pooveys and spent most of our holiday finding ways to entertain ourselves indoors through endless hours of card games, business ideas and burning pizzas. When we all found out we lived only miles away from one another we knew we would be life long friends. And so it was; vacations, concerts and visits to one another’s homes for parties. During this time of our initial friend courtship, I was also trying to get pregnant. We had been unsuccessful, until April 2009 on the exact day that my grandfather passed over to be with my grandma. If you have already read the post above, or if you don’t have time, in short, I believe my grandparents had a role in the very special delivery of Q & E and of course Baby M.
My grandparents we married on October 5. Will’s Birthday is October 5. As I sat in Will’s memorial and stared at that date, chills spread throughout my body. Somehow it was linked. KSP and I never meet people on vacation. After years of travel, Will and K were our first resort friends. We made time, invested time to spend with them and they with us. Will’s brightness and K’s spirit kept us coming back for more. That night in 2009 for Will’s 39th birthday, I almost didn’t go, I was tired and working late. I was pregnant. But it was Will. I wanted to go. 48 hours later I gave birth to Q & E. What I once saw as the most traumatic things in my life (and some days it creeps up and haunts me), I now see as a blessing in most ways. Had Q and E not been born so early, we would not have tracked E’s progress. We would not have had such amazing access to doctors, and resources. We wouldn’t have known she was delayed. We might have waited even longer to have her genetics test. We wouldn’t know she had Angelman Syndrome. So today, on what would be Will’s 44th birthday, I know why we he came into our life. Why he flashed so briefly, but with such strong light and presence he will stay with us in our lives and our family, forever. Why his memorial program will go in Q’s memory box so he can one day explain the significance of what I always thought was a chance meeting to his sisters and his own children. Will, you are missed, and we are and always will be connected. Thank you for the many gifts you shared with us and even from afar we can feel you still burning brightly so that we will remember to aspire to the same success you achieved in your too short of time here with us. You are the epitome of ‘mynewfavoriteday,’ the ability to find a moment of joy and share that despite what swirls around you. I may not have totally understood that then, but I do so understand it now. You are truly a Supernova in a galaxy of stars. And to my beloved Grandma and Grandpa, take care of our Will. Happy Anniversary. If I could have known. If I could have planned. If I could have said, “it’s not the right time.” I would have never known, could never have planned, and would never have said…for she is the greatest gift. She is the purest form of the deepest gratitude and love. She holds her own space, her own gift for bringing light and love and healing to my heart. I watch in awe as she naturally does what Q and E had to work hard to do. Each movement, acknowledgement, giggle, twinkle, brings incredible amounts of joy. Of the what it feels like the first time. The first word, tooth, stand, game, kiss, hug, and step all create something so much larger than I knew existed. She is enchanting to everyone she encounters. 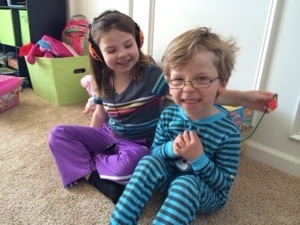 She giggles with her brother and teaches and engages her sister in a way we could have only hoped for. For me, and our family completes the us in a way we didn’t know or think was necessary, and she is a gift. Today, July 22nd, there will be a lot of press about Prince George and his turning 1, but what the world may not know, is there is an princess who quietly slipped into the world on July 22nd, 2013 with such force that she changed all those her have come to meet and know her. Baby Mia Isablle. She has special powers to change the world and instantly changed our family with healing powers we didn’t expect and didn’t know existed in this space and time. In what has been a crazy 5 years filled with so many emotions and ups and downs, twist and turns we still know how blessed we are…everything that happens or crashes upon us now in the form on news and events is put through the filter of these years and how we have been supported and held up by one another and all of our family and friends. For each of my minis in their own way, I am a different person. A different mother. A new mother. That woman before, without her minis, seems unfamiliar and unknown, not in a bad or an unhappy way but in a way that would have been entirely different across my entire life, personal and professional. For each child, I am a new person. A better person. Today as we celebrate baby M’s birthday, I am a grateful mother. The past 5 years feel like a lifetime of learning and growing and the past year is the part that I know I was meant to find and experience. From all the fear and the unknown was the path to healing and wholeness. To think that last year at this time, I was sobbing in a car dealership about buying our minivan “Foxy” is so far away from where I am now (expect for the mini van part, although the automatic doors and storage space are remarkable). We will all go through challenging times, months, and even years, and then, unexpectedly, in a moment in time, we will realize what it is all for…the moment when you understand the gift. It most often seems to come after a time of hardship and sadness, but with eyes wide open to all is not lost, we can see what’s possible and waiting. For us, and me, it’s the love of Q, E, and M…the gift of a complete family puzzle where KSP and I can look into the future and see a place where Q is amazingly smart, caring and empathetic, E is a light that shows us what’s entirely possible in life, and M who gives us the opportunity to know what first times are like free of worry and fear. We are blessed and it is an absolute certainty that Baby M is a huge part of what the future holds in the form of happiness, excitement, joy and of course a little bit of fear due to her lack of the fear! Happy Birthday to my sweet baby girl, Mia and please join in my “mynewfavoriteday” in my moment of understanding a gift. As I type this post, I am not even sure what the title should be. I am struggling for the exact right point of entry to my own thoughts. My mind swirls with thoughts and my heart with emotion as I look for the confidence to say what I want to say about trusting yourself, your instincts. About not letting yourself succumb to “mommy guilt,” or for those that experience any of the other countless descriptions of guilt for any small infraction or perceived slight against someone else or even yourself. Guilt is a powerful emotion that can make us do things we might not normally do, and prevent us from doing others, but in almost every scenario of guilt, if you stop for a moment and listen, a combination of your head and your heart will tell you what’s right for you. If you listen you can feel it speaking to you and encouraging you to trust the your inner voice. Some may take this deeper and combine it with faith, others may simply view it as instinct and as usual, I am going to just write what I am feeling and keep my focus on overriding guilt. For every mother who has gone off to do something for herself fun or work-related, or parent who has taken one child out for special time and left the others at home, you know this feeling. For every child who has not gone to visit a parent as they try to manage their own life as an adult you know this feeling. For every person who has stayed in a relationship longer than they should or not acknowledged one they should have stayed with, it’s all the same. The battle of head/gut and heart and you know this feeling. As Q and I sat next to one another on our plane ride back from visiting Aunt D, Uncle T, Special K and Bman, I am grateful I listened to my inner voice and made our reservations for just the two of us to go back East on our very special trip. For weeks leading up to our trip, I was sad and anxious. 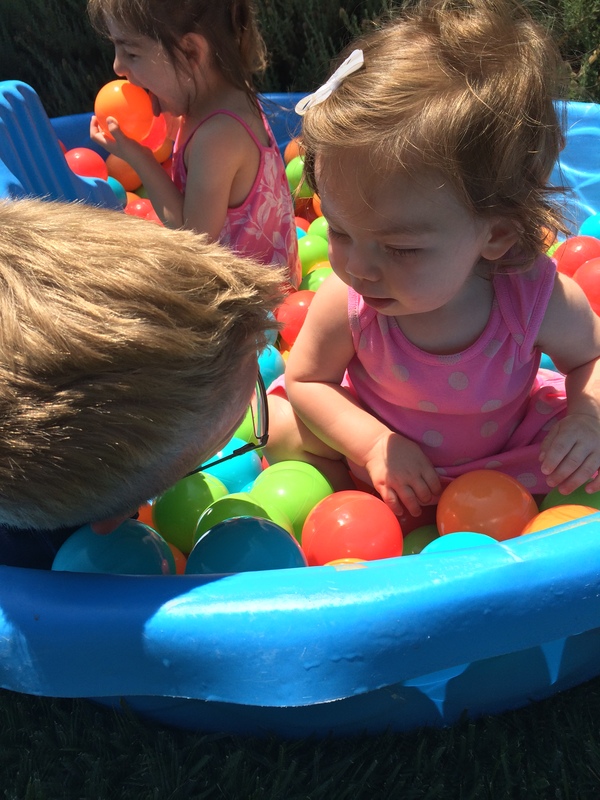 Every time I talked about going, I had a feeling of guilt and a twinge of sadness at leaving E and M behind, most specifically, E. Like Q, she had never met her cousins. She had never been to see the snow. I volleyed back and forth with the ” this is good for just Q and me to do together as we don’t get much special time,” and “if E was the same as Q in her abilities,” would I take her? An unfair and yet ever so predictable question. 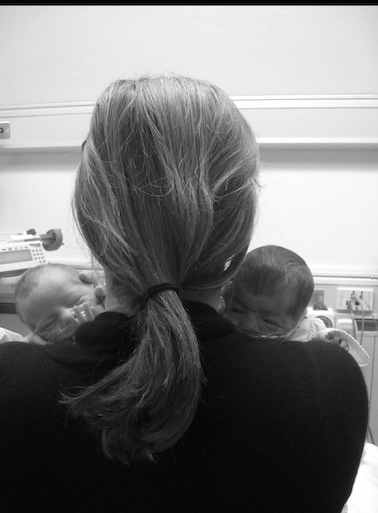 The vision of Q and E in my mind as they toddled through an airport with their names on their backpacks when I first found out we would be having twins would sneak into my mind and sit there quietly while I processed my feelings and thoughts. And then the reality of the situation would settle over me, and thankfully, my instincts seem to have a very strong opinion and like a bull in a China shop would bust into my reverie and shout that I cannot not think that way! I need to reshape the vision to me and Q having a blast as we ride on the plane in eager anticipation. As we hold hands in the airport. As we greet Aunt D and his cousins at the curb. As I watch Q and Special K rile one another up to the point where we as “adults” have to intervene. Where the 4 of us have a sing a long to Frozen’s “Let it Go” and find out the even 14 year old Bman is super excited about “Frozen.” Where Q, Special K and Uncle TJ head off to the movies all bundled up and talking like little adults. These are memories I am not only giving him, but giving me. I am doing something for us. Something just for him that gives him his place outside of his sisters. Now, that we are home and settled back into a routine, that trip feels like months ago. Life goes so fast and he is already different from he was on our special trip. My inner voice knew this. That we must take these moments in time and listen to a combination of what our hearts and head tell us. I am so so so glad I did listen and trusted myself because he has told me that this was what he needed. When I asked him last week if he remembered our trip and if he had fun, he said “yes, mommy.” And, when I asked him what his favorite part was, I expected him to say, playing with Special K, or going to Chuckee Cheese, and instead he melted my mind and heart with his sweet voice saying, “it was being with you mommy.” Chalk one up for listening and self-trust. Each time I listen I am further reminded of my purpose. The purpose of guiding my minis as they grow as people. The purpose of having them know that I love them beyond the Universe and that I am constantly striving to give them what they need as individuals within our own unique context of family. Taking this moment of acknowledgement and allowing that to make today “mynewfavoriteday.” I hope you will do the same. No matter what the issue, easy or difficult, there is a reason we have this voice, and while it might not always make perfect sense at the time, eventually when you can piece it all together, it very well may feel as if somehow you had a crystal ball and help reinforce or clarify your own purpose.